I HAVE TWO THINGS TO REPORT. Will and I are celebrating our 16th anniversary today. 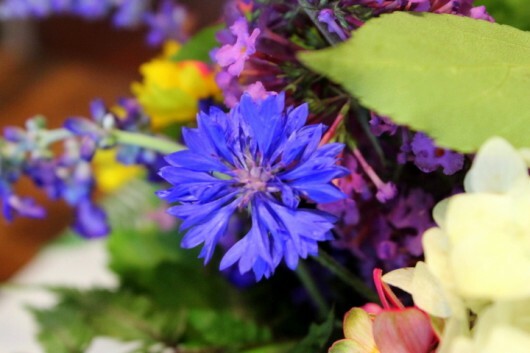 And next, Erin Brady stopped by to show how common garden flowers can be turned into a glamorous centerpiece. 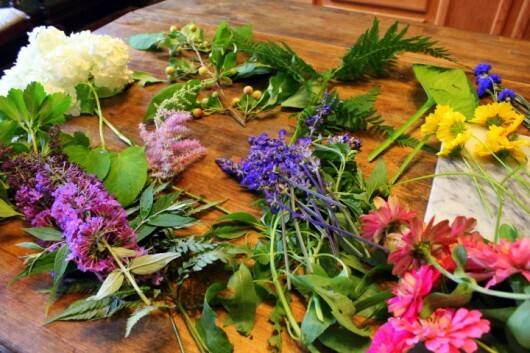 At 6:00 this morning, I sent Erin an email, asking if she could help me select flowers and greens from the gardens here, and then arrange them in a bowl. She quickly agreed. 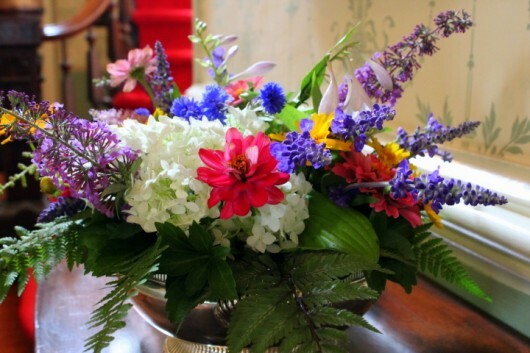 But when Erin arrived on my front porch, I noticed she had brought along a bucket of fancy florist flowers. How odd, I thought. Did she not understand our mission? As it turned out, Will had visited Erin’s shop last week, and arranged for her to visit the house today. She was supposed to ring the bell, and ask if she could “borrow a vase.” She’d take the vase back to her shop, outfit it with the kinds of flowers I like, and then deliver it later as a surprise anniversary gift. The only snag? Erin sensed that I’d know something was up. Because why on earth would a professional flower arranger (who also works in a flower shop) need to borrow a vase? Anyway, Erin was relieved when I asked her to stop by. The vase-ruse wasn’t necessary, and thus the surprise was really a surprise! I’ll show you the anniversary arrangement in a future post. Meanwhile I’d just like to say that Will is a sneaky guy. He’s also a considerate mate! First, select a bowl. 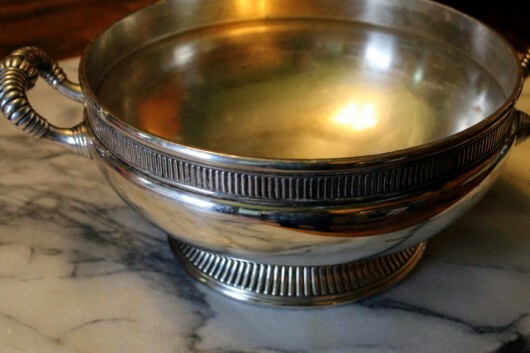 I used my sterling silver bowl, but any water-tight container, at least 2-inches in depth, will work. I suspect you have such an item in your own collection of serving pieces. 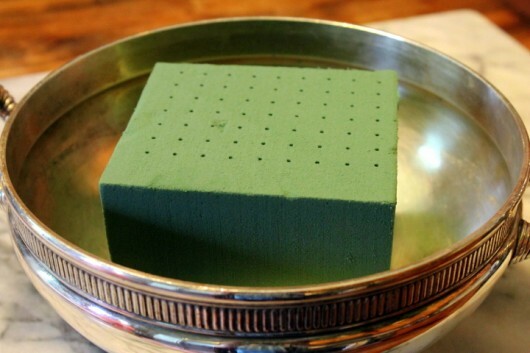 Next, grab a block of floral foam (sold as “Oasis”), and cut it to fit the bowl. Add water to the bowl, and let the foam absorb it. 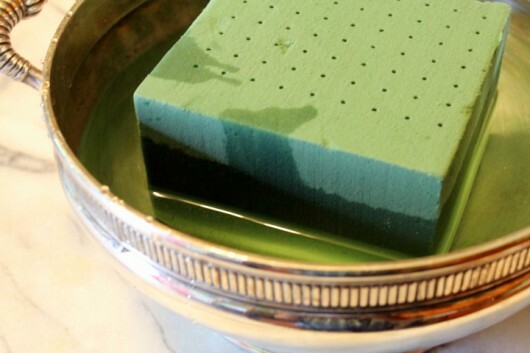 The foam should be thoroughly saturated before any stems are added. 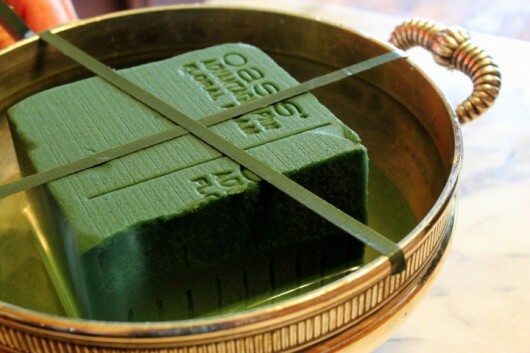 Use green florist’s tape to secure the foam to the container, as shown. The tape will keep your green “pin cushion” was bouncing around during stem-sticking time. Note: You can obtain floral foam and florist’s tape from just about any craft store. You can also order the items from Amazon, and have them delivered right to your door. 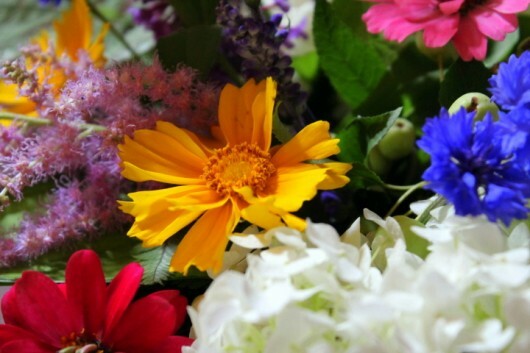 Now head outside, and collect some flowers and greens! 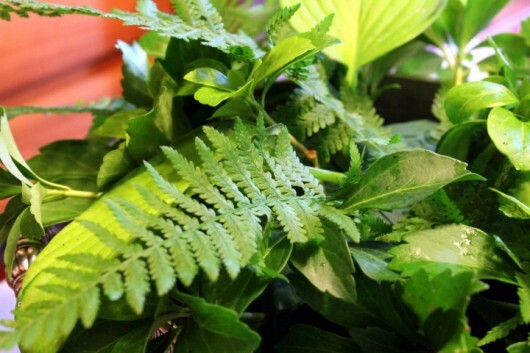 And speaking of greens…Erin and I both agree that these are the secret to a lush, formal arrangement. 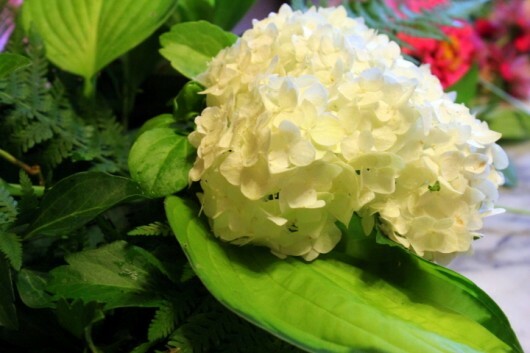 If you use enough greenery, only a small quantity of flowers will be necessary. 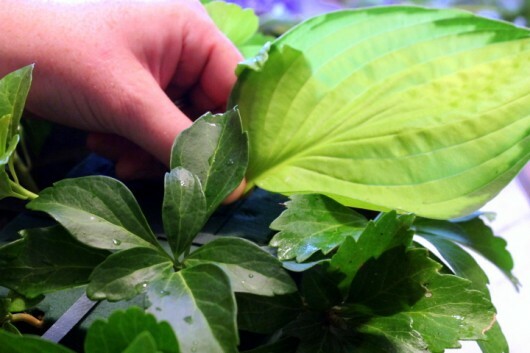 We clipped several stems of pachysandra, and arranged them around the perimeter of the bowl. From the Woodland Garden, we cut three hosta stems. The variety is ‘Paul’s Glory.’ Erin placed two stems in the “front” of the arrangement, and one stem behind. along with fronds of this eerie-looking “ghost” fern. And zinnias in assorted colors. 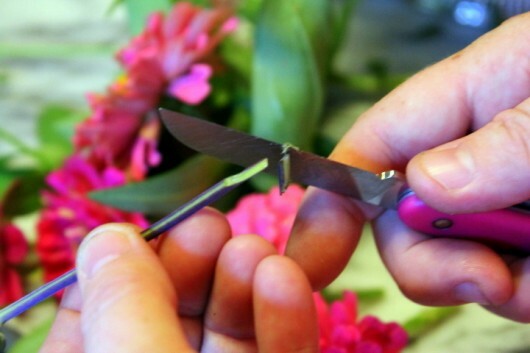 Two tips from Erin: Always cut the stems of greens and flowers with a sharp knife. Also, make the cut at an angle. The angle-cut increases a stem’s ability to absorb water. Now, where to place this low-arrangement? Well, I thought it looked dashing in the dining room. And in the parlor, it brought magic to the mirrored mantel. But I especially liked what it did for the swivel-top tea table near the staircase in the entrance hall. So there it shall remain. 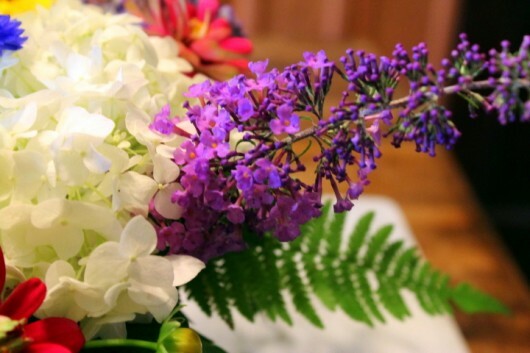 With the daily addition of water, the arrangement will stay fresh and lovely for 5-7 days. And this beauty was achieved for no expense at all! 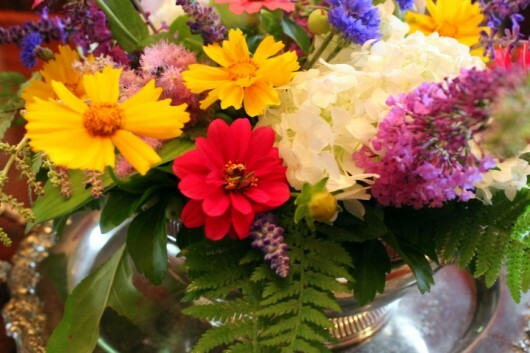 Has this tutorial inspired you to produce your own, unique bowl of garden flowers? I certainly hope so. Perhaps you can voice your thoughts in the comments field below. Happy anniversary! The flower arrangement is gorgeous! I remember being able to bring in flowers from the garden. It’s been do terribly dry here in SoCal lately that all our flowers are falling. So sad. I hope you and Will had a happy anniversary celebration. Here’s to MANY more happy years together! All you need is love. Many more! 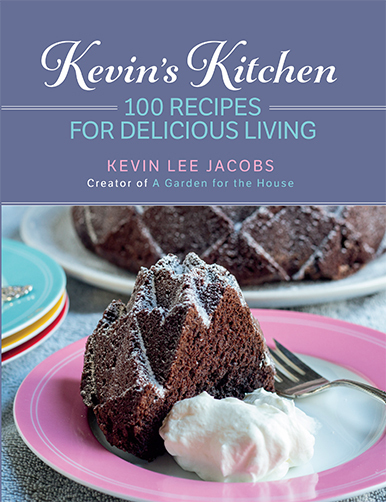 I so enjoy your blog recipes etc thanks from Aussieland! Happy Anniversary, Kevin & Will. Sounds like you’ve built a happy life together, and we’re the lucky beneficiaries! They are beautiful. Happy Anniversary! Happy 16 years and the arrangement looks stunning. Congratulations on your anniversary! 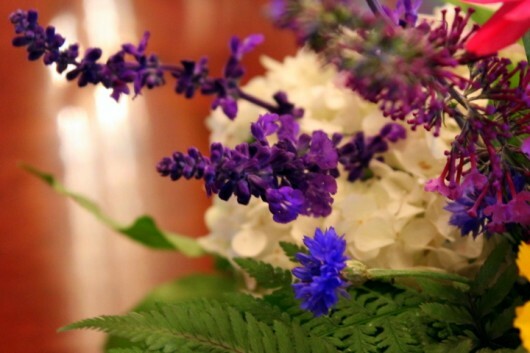 And how cool of Sneaky Will to surprise you with flowers — as a wedding officiant here in California, I always love hearing about couples doing those kinds of special things for each other. If the two of you ever decide you want to do a renewal-of-vows, I’d be happy to hop on a plane. 😉 I understand you maybe have a garden setting that might work…? Happy Anniversary! You always inspire me. A very Happy Anniversary to you both. As always, Erin’s arrangement is just gorgeous. So glad you are sharing her talents with us. How beautiful! Belated happy Anniversary! Loads of happiness to you and Will!! The arrangement is beautiful and, as always, your instructions and tips are so helpful. Two things: first, I love a good love story, so happy anniversary to you both! and second, I am clearly just a lowly vegetable gardener who happens to have some flowering plants around…but not enough right now to make such a beautiful arrangement (although, with your tutorial, I feel like I COULD, if only I had the materials!). This inspires me once more to focus more heavily on the flowers for winter sowing, etc. in my gardens for next summer. Thanks for the lovely post. Kevin, Happy Anniversary to you and Will. Your flower gardens are obviously showing the love you share with them. I walked around our farm and took a video of my gardens. So many varieties of daylily, Asiatic lily and tiger lilies and perennials and all are extra lush this summer. I plan to gather and put together an arrangement (or two) for our company on Saturday. Thank you for the beautiful photos and ideas. Happy Anniversary! Erin Brady does an outstanding arrangement once again!!!!!! She certainly has talent. As the old folk song says….there’s only two things money can’t buy, that’s true love and home grown tomatoes. I’m so glad you have both. 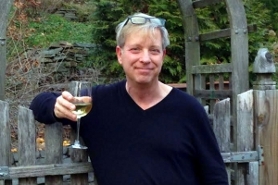 Thanks for the work you put into your blog, as you know…you make many people glad you do. July 29th is My anniversary too!! My hubby Paul & I have been married 20 years, but have been together (and married in our hearts) for 30 years. Hope your next 14 are as sweet and exciting as ours have been….. 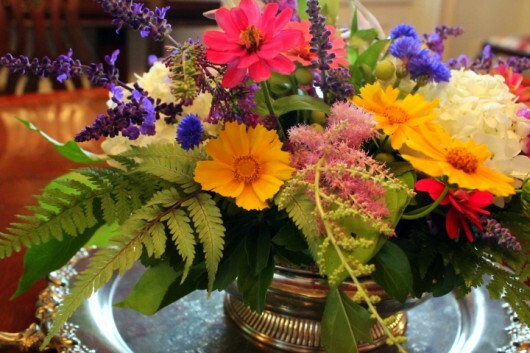 Happy 16th wedding anniversary Kevin and Will…many years of happiness….love the flower arrangement too!!! Want to let you know the milk and water spray works on roses. I was about to throw out all my rose plants as the hot, humid, sea spray weather I have is a real boon for black spot. No more. Thank you, thank you. 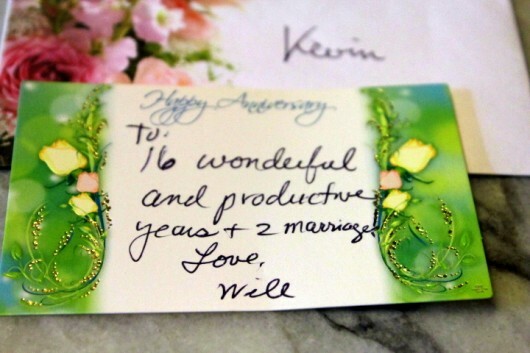 Happy Anniversary Kevin and Will, The flowers are beautiful and thanks for your blog. You can find it on Utube – it is a lovely song to dance to. Happy anniversary! I wish you many more happy years! Happiness shared is delight doubled. Thank you for letting us share your joy of 16 happy years. May this be just the beginning of many many more years to come. Happy Anniversary Kevin & Will! 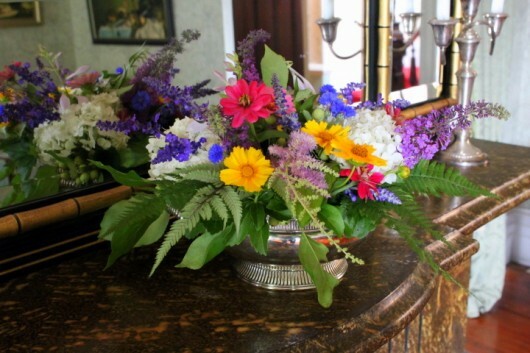 Love the lovely arrangement – doesn’t take many flowers to have an impressive centerpiece. 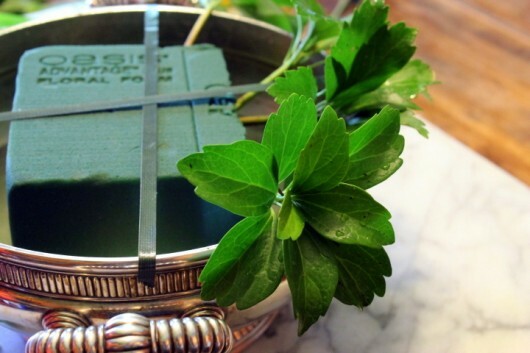 I recently used Swiss chard, dill seed heads, coriander in various stages – flower, seeds; flat leaf kale, parsley, oregano blossoms – placed in a blue Ball vintage quart jar tied with raffia. It was lovely – the perfect gift for an 80th birthday celebration. Happy anniversary and the flowers are so beautiful. The bowl is as stunning as what’s in it. I use that mirror trick a lot around here with bouquets and arrangements. Congratulations on the event of your Anniversary! d many more to come. HAPPY ANNIVERSARY!! 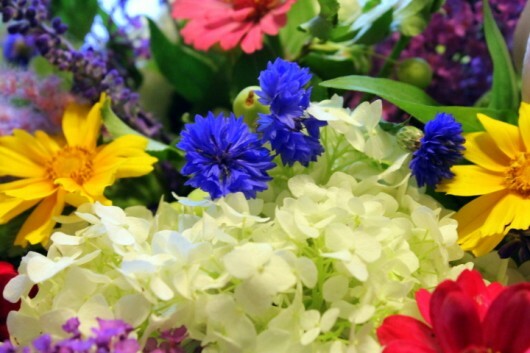 Good tutorial on a mass arrangement…my favorite kind of arrangement. 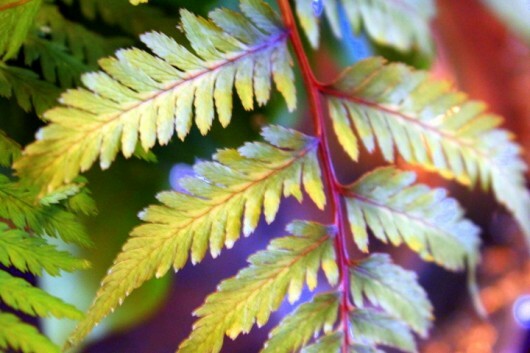 Clearly, I have to plant some ferns and plant flowers that are good as cut flowers. I have too many day lilies! Hope you share what you all had for your anniversary dinner….yum! I never thought of doing this , and i used to be a floral designer, My garden has so many flowers, hostas, ferns, I am ging to try this for my daughters up and coming graduation party that we are having in our Garden. I ususally get some greens and put them in a vase. This time I agoing to make the effort to wow them !!! !